THE Office of Civil Defense (OCD)-Davao noted a total of 4,103 evacuees in Davao region who evacuated due to Tropical Depression (TD) Chedeng, but no casualties have been so far recorded during its onset. Leslie Francisco, information officer of OCD-Davao, said based on their situation report issued Tuesday, March 19, around 8 a.m., there were 19 barangays affected with 978 families forced to leave their homes to seek safer ground. Some of these evacuees were temporarily sheltered in the gym and barangay hall. Data showed that Davao Occidental, where Chedeng had made landfall in Malita around 5:30 a.m. on Tuesday, noted a total of 1,675 displaced individuals, Davao Oriental with 2,413, Davao City with 15 individuals. Their consolidated data for Compostela Valley province has yet to be determined. 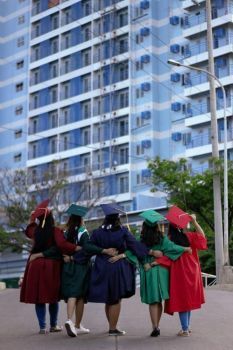 Figures may possibly go up as OCD is still gathering all reports from different provinces. In the weather bureau’s advisory at 4 p.m., Chedeng has weakened into a low pressure area; thus, all tropical cyclone warning signals have been lifted. However, they further advised that scattered to at times widespread moderate to heavy rains will still be experienced over Surigao del Sur, Agusan del Sur, Davao region, Soccsksargen, and portions of Northern Mindanao, Bangsamoro and Zamboanga Peninsula. In preparation for Chedeng, OCD-Davao participated in the Simultaneous Pre-Disaster Risk Assessment Emergency Preparations for Response (PDRA-EPR) meeting spearheaded by National Disaster and Risk Reduction Management Council (NDRRMC) on March 17 to iron out plans and strengthen coordination with other government agencies. The alert status of operations center in Regional Disaster and Risk Reduction Management (RDRRMC 11) has been elevated to Blue Alert Status. OCD 11 had issued memorandum to local DRRMCs to likewise hoist their respective operations center alert status to Blue to closely monitor their respective area of responsibility for the possible effects of the tropical depression. All the RDRRMC-Davao Response agencies were also on guard and were advised to allow all local DRRMCs to optimize the utilization of their response assets including food and non-food assistance to the affected families or IDPs. The Department of Social Welfare and Development (DSWD), meanwhile, prepared a total of 6,049 on-floor and readily available family food packs for the displaced victims and continuous repacking in the warehouse is ongoing. A P3 million disaster stand-by fund is also readily available for any eventualities. In Davao City, the CDRRMO has conducted pre-emptive evacuation to landslide prone areas in Matina Crossing (Purok Guadalupe, Quiniones Compound, Pluto Street GSIS, Shrine Hills Diversion Road, Milky Way St. and Virgo St. GSIS heights; Barangay Mandug (DDF Village Mandug); Barangay Buhangin (Purok Damayan); Barangay Maa (Juario Village, Purok 9 Shrine Hills, Nacilla Village Shrine Hills, Dinaville Subdivision and Iñigues Village), Barangay 19 (Awhag Subdivision, Barangay Matina Pangi (Diversion Road Dumpsite; and Barangay Tigatto (Purok 16); Talomo (Bypass Road) to ensure the safety of the residents susceptible to disaser. 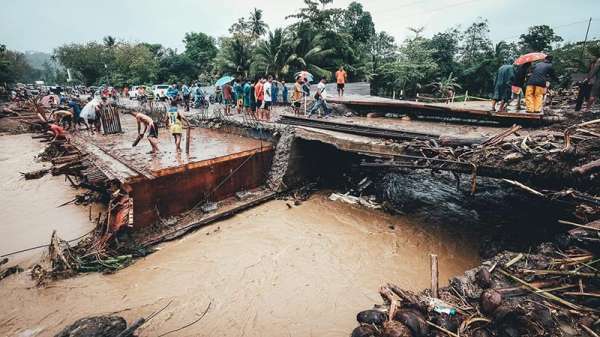 Davao Oriental Governor Nelson Dayanghirang has ordered all concerned agencies to fast track the repairs of the Masipit Bridge in Tarragona town which was damaged yesterday when Chedeng struck. “Governor Dayanghirang, who was joined by Vice Governor Niño Uy, ordered the Provincial Engineer’s Office to work and coordinate with the Department of Public Works and Highways (DPWH) District Office and Municipal Engineer’s Office to fast track the repair as they inspected the site earlier today,” the statement in their official Facebook page read. The bridge was impassable Tuesday after the incessant downpour has made the bridge unstable and unsafe for vehicles. The statement added that the engineering teams from the province, municipal government, and DPWH are working together and consolidating efforts to build the embankment to make it passable.